People not familiar to the local financial advisory scene may not know about the different types of practitioners available. This is forgivable since such details are not presented well to the public. The thing that I find laughable is that many people in the industry themselves are confused over the types of financial advisers available. Hence I hope to clear the air regarding the types of financial advisers that one may engage for his or her financial needs. Before we proceed it may be worth highlighting that Singapore has quite a strange naming convention. The term “Financial Adviser” actually refer to a company instead of the actual individual/representative, who are typically given other titles. 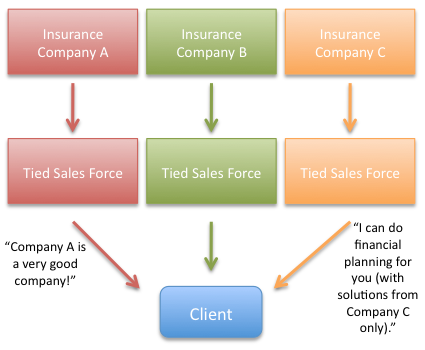 The original form of distribution, a “tied” agent is a person who represents a “captive” insurer to promote its products. As the name suggests, the tied agent is contractually tied to its insurance company and its interests. Almost dominating the market for decades, the tied model has seen its share of new business fall from 88% to 56% in barely 10 years after MAS’s decision in 2001/2002 to revamp the industry through the Financial Advisers’ Act (FAA). The FAA gave rise to financial advisers who can give advice on a wide range of financial solutions instead of just representing a single product provider. Such financial advisers can give advice on and recommend solutions from the majority of not just life insurance companies, but also from investment providers and general insurers amongst other product providers. All but just two of Singapore’s life insurers have partnerships with financial advisers. It’s likely a business decision for the remaining two companies which currently have sizeable sales forces to rely on as their main distribution channel. As the tied distribution start to wane in popularity, I expect them to turn to partnerships with non-tied financial advisers as well. 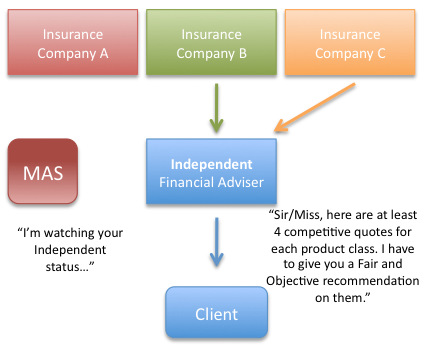 The Non-Independent Financial Adviser is able to make business deals with product providers. For example, Insurance Company C may offer certain financial incentives for a particular product to be preferentially sold. Targets are usually imposed before such incentives are rewarded. This can create a significant product bias when it comes to recommendation due to financial inducement. Independent Financial Advisers (IFA), like Non-Independent ones, are able to provide advice and solutions from a wide range of product providers. The most important difference is that there are stringent regulatory requirements for a Financial Adviser to label itself Independent. One of the requirements is that the IFA must clearly demonstrate that it does not have financial or commercial links with product providers that can influence their recommendations. Also, if commissions are involved, they must be of a broadly similar level for similar products, and even other non-commission benefits are taken into consideration. Moreover, IFAs are expected to provide “Fair and Objective” advice which is a much stricter requirement than “Reasonable” advice which is expected of other FA firms. There is a 10-page long document (PDF link) that details the regulated usage of the term “Independent”. With the many requirements involved, it is natural that many Non-Independent Financial Advisers have opted to remain non-Independent instead. From the document, even MAS notes that “only a small number of financial advisers in Singapore will be able to use the term ‘independent'”. The clash of interest between the adviser and client is greatest in a tied environment since the agent represents the interests of his/her company and can only recommend his/her company’s solutions. This clash of interest can be minimised with non-tied financial advisers, but in some cases can be magnified as a result of the firm cutting deals with product providers. The clash of interest is smallest with an IFA as there are higher levels of regulatory measures to ensure that clients’ interests are kept. Unfortunately, due to the stringent requirements, it does not make much business sense for firms to opt to be Independent, and hence there are very few true IFAs in the industry. Personally, I have chosen to be in one of the most credible IFAs around which started as an independent insurance broker decades ago – one which has the conviction in the value provided to clients by being Independent that it has the word right in the name. I am quite incensed by the many Non-Independent Financial Advisers who verbally claim to their clients that they are IFAs, trying to position themselves as Independent when they are not. Some companies go as far as to describe themselves as “independently-owned” seemingly trying to achieve a certain effect. As a result, many people, including even some financial practitioners, believe that non-IFAs are IFAs. Recently, Straits’ Time Lorna Tan wrote an article relating to a firm’s Independence after a Non-Independent Financial Adviser made news regarding a business deal with a product provider that went sour. 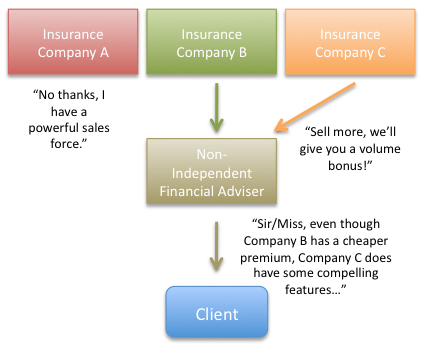 I have noticed many tied agents ignorantly blogging about this as an example of why IFAs are not beneficial for clients. It is clear that they do not realise the distinction between an true IFA and a non-IFA – The very reason why an IFA chooses to be Independent is to affirm and subject itself to higher standards of regulatory scrutiny such as to ensure that its clients’ interests are kept. It is even more hypocritical when tied agents make aspersions against the IFA model when their form of business poses the greatest disservice to their clients. More mature financial markets like UK and Australia have long been dominated by IFAs. It is now up to clients who will need to vote with their wallets in order to get the best value possible for themselves.